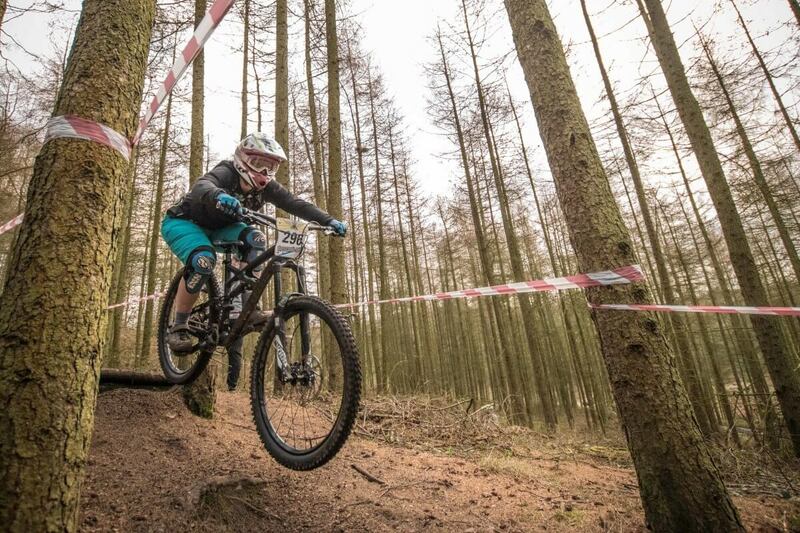 The event took place on 21st February there were 112 riders competing with 8 in the women’s category. Here’s Rebecca’s race report. It’s a month since my last race and as this one approached the nerves ramped up disproportionately to the race size. It was a small friendly regional race for round 2 of the Racers Guild Winter series at Stile Cop. I visited the track last week and loved it. It’s techy rooty at the top and balls out tree dodging at the bottom, perfect. My kind of track since I love roots, even the ones that scare me! At the last race I came last and although I thought I was over it the increasing nerves let me know that I was not. What if I came last again? It was another strong field and I was feeling my time off the bike over the winter. My finger was mostly fixed and although I was raring to go I’m not ashamed to admit I was scared of failing again. Suddenly I was doubting my ability to hit the 2 tricky rooty sections despite nailing them every time when I went to check out the track last week. Then it all changed when a face full of sunshine hit my doormat in the form of a purple packet emblazoned with Flow! I peeked inside the wrapper like a kid on Christmas day….. the flamingo jersey was finally here, whooohooo! I had been waiting for my new DHaRCO kit since I first spied the jersey in a Flow post on Facebook. I love flamingos, or flingamungos as they are affectionately known in my family thanks to my niece. The jersey was like a summer cocktail and when combined with my aqua shorts and their orange starry waistband I was back on a tropical island ready to hit the dust… or mud since this is February in the UK. Race day arrived 2 days later and I was buoyant as I pulled on my new kit. I twirled for my sister and then set off on the short drive from her house to Stile Cop. The nerves made themselves known again but I’d parked next to team mate Kate so a banter filled track walk helped push them away. I soaked up the compliments about my kit and Edith’s new bling sugar skull headset cap. I was pretty much bouncing as we lined up for our first practice run. I made it through the first set of roots and then nearly crashed off the little drop just before the next set so I lined up for tricky set 2 with one foot clipped in and no speed uh oh! It turned out not to matter as I cruised through anyway. Awesome, that gave me a bit of breathing room. Run 2 and the same little drop got me again which given I had never noticed it before was a bit surprising. A new line soon solved it and I was flying sideways through the mud grinning my head off. I wanted to hit a line over a stump through some roots and towards a tree at the bottom but kept bottling it. That tree had my name on and I could already see my face print on it! I gritted my teeth hung on and did it. I missed the tree and although it wasn’t pretty it was faster. Watching the rippers first run I was yet again in awe of the little dudes and dudette on their mini bikes. We chit chatted about lines and trees that people were struggling with then before I knew it we were on track. I’d been getting more bouncy (think Tigger style) all day so as I came into the 2nd rooty set on my first race run I jumped the roots instead of rolling them. I surprised myself when I cleared them but then stopped dead when I didn’t clear the tree! I was track standing, facing up hill in a silly gear clipped in, a graceful scoot solved it and I raced off chortling. 7th. OK I was happy enough with the place but not my time so tree avoidance and a calmer run was needed for run 2. My family turned up to watch my last run and they found me because they could hear me…..OK maybe a quieter calmer mindset for run 2 needed some work! I got on track, missed the tree, saved 2 seconds and finished in 7th. I could have been faster but I had a smooth and calm run, nailed all my lines and had bags of fun. Racing can be serious so it was great to really enjoy myself; popping off little whoops, trying new things, attacking features instead of backing off and generally remembering why I ride my bike. The whole day was great fun with a good bunch of people. I made new friends, shared stories, chatted about bikes, lines and creepy spiders in the undergrowth (you know who you are!) and cheered on competitors, sharing that camaraderie that only comes from racing. I can’t wait to race next weekend but I do hope that the wildlife is less bitey and the weather is as kind. Come on storm Doris get it over with and get gone before Sunday! Oh I almost forgot, I always crash big time when I wear an item of new kit but somehow I got away with new shorts and a new jersey with only a bar clip on that tree. Maybe things aren’t as set in stone as you think. Or maybe the flamingos lent me a grace I don’t normally demonstrate hahaha! A huge thank you to Flow MTB for the amazing kit and support and thank you to The Physio clinic Bristol for keeping me on my feet.